When my mom was diagnosed with breast cancer six years ago, I felt helpless and confused. Her sister had died from the disease just nine months before, which made my mom’s diagnosis that much scarier. Instead of just worrying, I wanted to do something. So like many others, I began to purchase pink ribbon products and participated in a pink ribbon run. One day after chemotherapy, my mom and I were in the kitchen and she picked up a pink ice cream scooper I’d purchased weeks before. She turned to me and asked: “where does the money go?” Neither of us knew the answer. And we realized neither of us actually felt supported by that pink ice cream scooper; we felt mad. I’ve since learned that a whole lot of pink ribbon promotions don’t do anything for women like my mom. And a lot of pink ribbon products actually increase our risk of breast cancer! Instead of giving money to a pinkwashing corporation, invest in Breast Cancer Action’s fierce, independent activism to address and end the breast cancer epidemic. After my mom finished treatment, I wanted to help make real chance in breast cancer. That’s why I came to work at Breast Cancer Action. I love that this fierce organization asks the tough questions like “where does all that pink ribbon money go”? I love that BCAction stands up to pinkwashing corporations who claim to care about our health but are actually harming it. And I deeply appreciate that Breast Action works to make changes that have a real impact – we work on primary prevention, on protecting patients in the drug approval process, and on telling you the real info about breast cancer, without corporate spin. 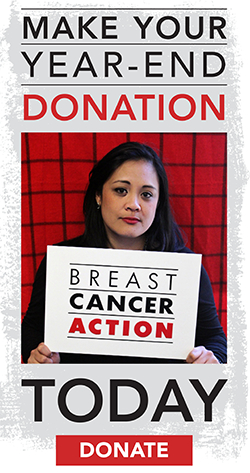 Join me in making a donation to Breast Cancer Action today. Your gift allows us to continue our vital programs that truly address the needs of women living with and at risk of breast cancer. 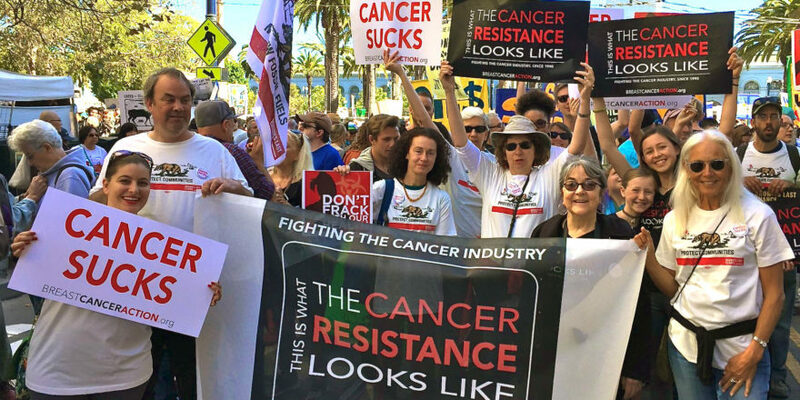 You can always count on us to do this work free from conflicts of interest because we don’t take money from corporations who profit from or contribute to breast cancer. I’m proud to work at Breast Cancer Action. I’m proud of the work we’re doing on behalf of people like my mom. Please chip in today so we can continue to stand up to pinkwashing corporations and demand better for all our loved ones who are living with breast cancer.